112 songs on four compact discs, continuing the critically-acclaimed series of Hitsville history. By 1962, Motown wasn't yet the hit factory it would later become, but they had regular chart success, and were reaching across the ocean to influence the emerging British Invasion. Both Smokey Robinson's "You've Really Got A Hold On Me" (later covered by The Beatles) and The Contours' Berry Gordy-penned smash "Do You Love Me" (covered by The Dave Clark 5 and Brian Poole & The Tremeloes) make their debut on this second volume of The Complete Motown Singles. The year marked the debut of four new imprints in the Motown empire: Divinity, Workshop, Mel-o-dy, and Gordy. It also saw "You Beat Me To The Punch" top the R&B charts, as well as cracking the Top 10 on the pop side. This four-CD set offers a miraculous peek behind the curtains of what was rapidly becoming "The Sound Of Young America." It features the A-side and B-side of every single released by Motown and its subsidiaries during the label's fourth year of existence. Each track builds ever closer to reaching Gordy's goal of growing his music empire into an entertainment juggernaut. Over the course of the set's 112 tracks, you can hear The Temptations masquerading as The Pirates, the vocal version of the "Theme From Exodus," and the phone number that was on the lips of America: "Beechwood 4-5789," courtesy of the Marvelettes. The opulent packaging resembles a scaled-down 78-rpm-era "album," with cardboard sleeves to hold each of the discs, and 88 pages of rare photos, detailed annotations and scholarly, as well as personal, liner notes. It also features a reproduction 45-rpm single from its era; in this case, it's Mary Wells' "You Beat Me To The Punch" b/w "Old Love (Let's Try It Again)". 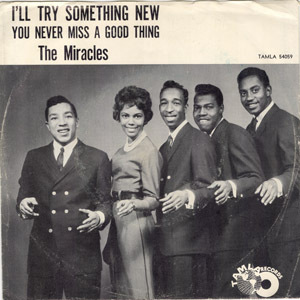 Claudette Robinson, a member of The Miracles and Smokey's ex-wife, contributed a personal essay to the set detailing the artist's-eye-view of life in the label's early years. Also included is an historical overview by author and scholar Gerald Early of Washington University in St. Louis, and track-by-track annotations, with not just song credits but stories behind each song, by noted authors and discographers Bill Dahl and Keith Hughes. The Complete Motown Singles, Volume 2: 1962 is a limited-edition set. Most of the songs contained on it are unavailable anywhere else. Many had never been re-released on vinyl, let alone on compact disc. Volume 2 is the second in the proposed 12-part series. This is Volume 2 of a 12-part box series.